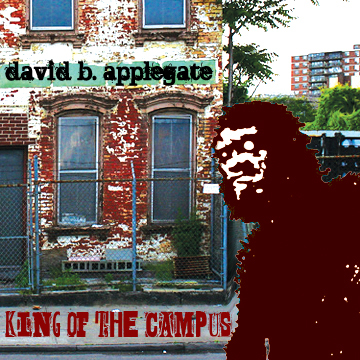 Crazed experimentalist David B. Applegate presents King of the Campus, the only album which can answer the question “Where is my electrified ruckus?” He jumps off the porch and busts into the shack to practice dub rituals & play arcane games with dice made from robot bones. Here, drums tell a broken video game when to shout and the basement still throbs to the frantic beat of a haggard ruckus. King of the Campus features a fresh strain of crooked no-wave techno in response to today’s pristine electronica. Is your favorite music something you haven’t heard yet? Download this album and experience fresh sounds for contorting your stomp.